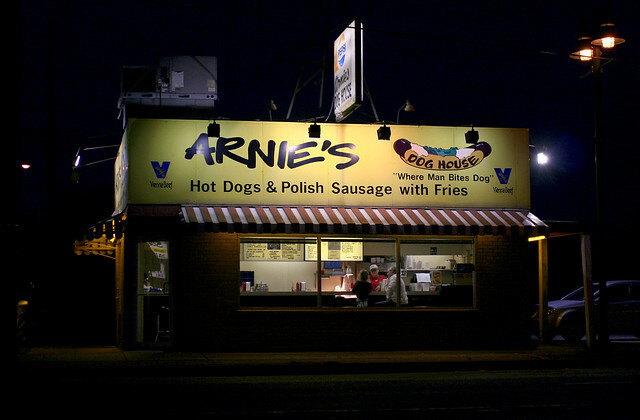 Ain’t no two ways about it – this town’s got a thing for hot dogs. 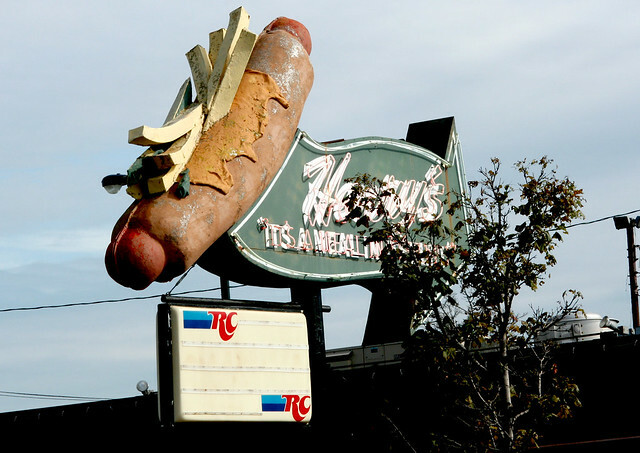 Henry’s Drive-In – 6031 W Ogden Ave, Cicero; opened circa 1955. See some photos of the building’s original state here; it was later remodeled out of its fantastic Modernist style, most likely in the 1970s. 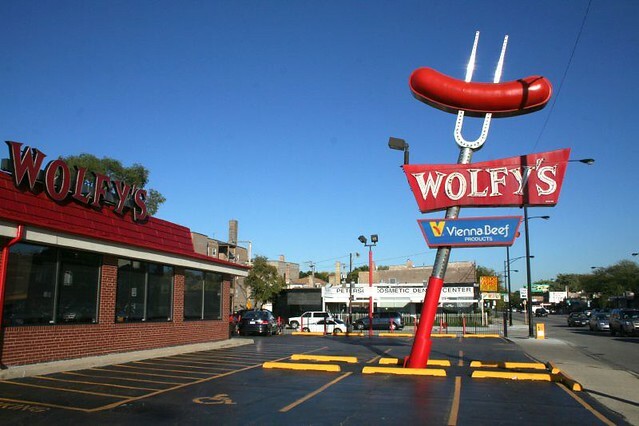 Wolfy’s at 2734 W. Peterson, opened 1966. The building is a totally plain brick box with faux mansard, but the sign is worth writing home about! 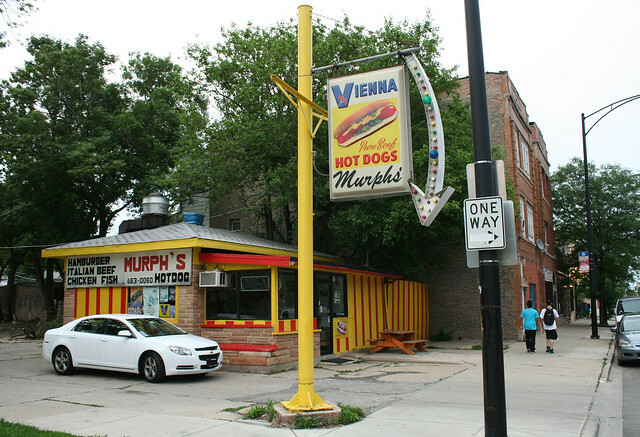 The hotdog stand – and its various associated roadside cousins – has a long and rich history in Chicago and its surroundings. From full-sized diners to small custard stands with no indoor seating, the roadside stand rose in lockstep with the automobile, and diversified into an infinity of styles and programs. How to tie together this group of buildings? They are not united by architectural style, not by venue or menu, certainly not by ownership. 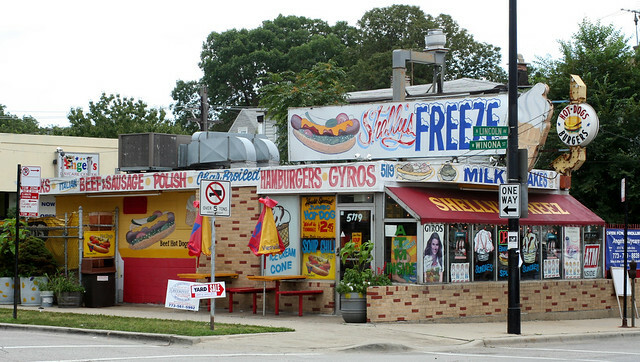 Most – nay, all – of these hot dog stands and hamburger carryout joints are independently owned and operated. Some have been around for decades. Their breed is certainly diminished from days of yore, but not yet vanished. They are less than a full restaurant. Floor space is minimal – small size is a common factor among most roadside stands. Ambiance and seating are optional. You do not come here for a fine dining experience; you come to gorge on greasy deliciousness. In a blue collar town like Chicago, passions run deep about cheap eats. I am no food critic, nor a foodie, nor even much of a greasy spoon aficionado. 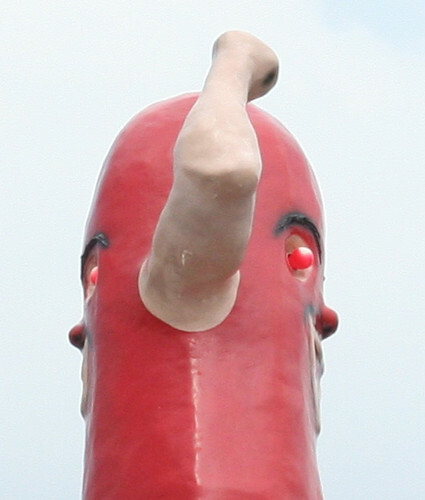 (I’ve never even had the famous Chicago style hot dog because I don’t like onions, or mustard, or peppers – and, horror of horrors, I like ketchup. You may excommunicate me at your leisure.) So – we’ll just stick with the architecture and history end of it. There’s plenty to dive into. 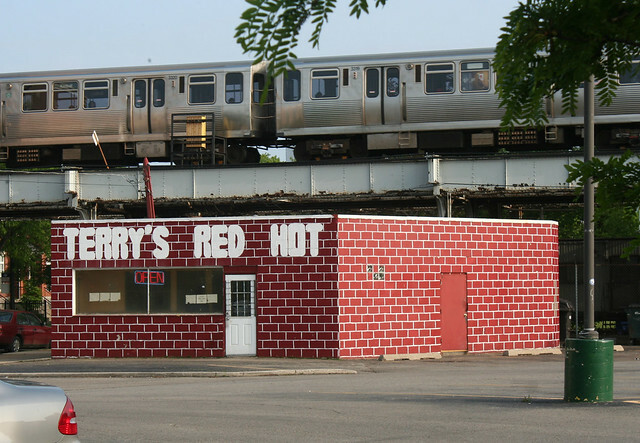 Terry’s Red Hot – 1554 N. Larrabee. Check out some of their food offerings here. One recurring style for roadside is the plain white box – intentionally simplified, with clean, neat lines reflecting the ideal of a clean, modern dining experience. 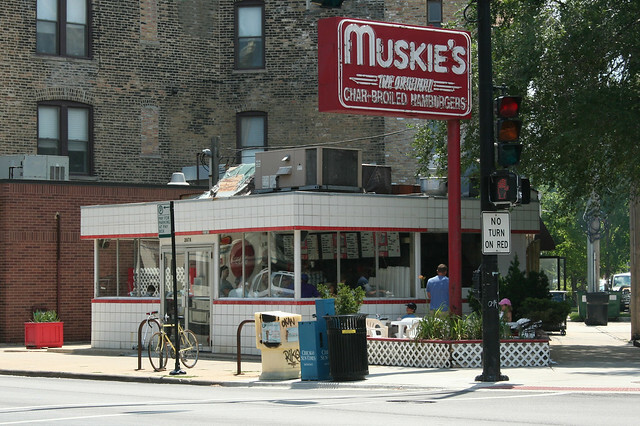 Muskie’s Hamburgers – 2878 N. Lincoln Avenue. The business opened in 1986, but the building has been there longer. No word on where they got that fantastic neon sign. 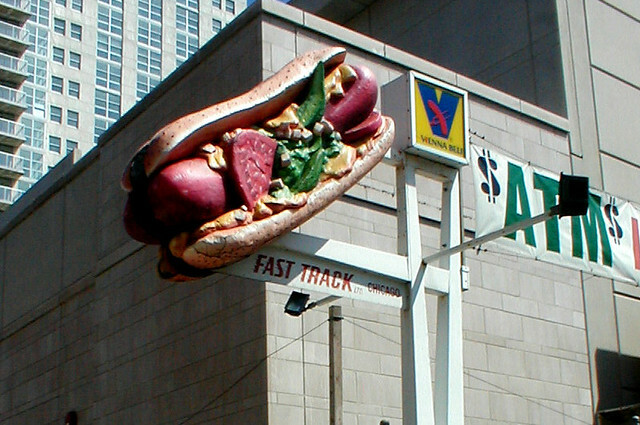 Al’s Italian Beef – 169 W. Ontario at Wells. Open by 1989, perhap earlier. Snappy Service System, 1141 N. Ashland – part of a Missouri-based hamburger chain that expanded widely in the 1930s. They signed the lease for this location in 1936. Later this was La Pasadita, a taco stand, whose yellow paint concealed the white tile for many decades until its removal in 2013. This info and more from The Chicagoist. 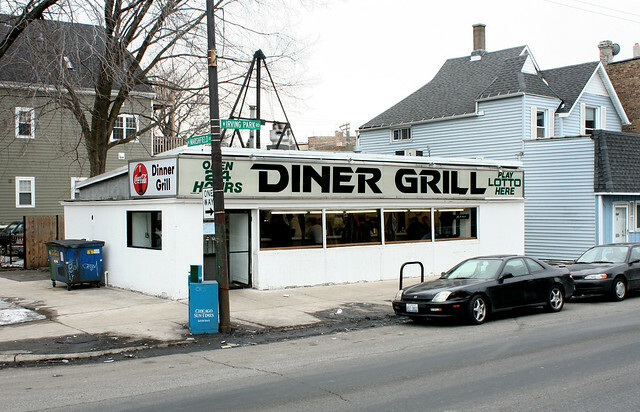 One of the city’s most revered greasy spoon joints is the Diner Grill, 1635 W. Irving Park Road. You’d never know it today, but the building is actually two old Evanston streetcars parked side by side in 1935, now so covered over and remodeled that hardly a hint remains of the building’s origins. Today it carries some hints of Mid-Century streamlining, particularly in the long band of windows and the shallow-pitched roof. 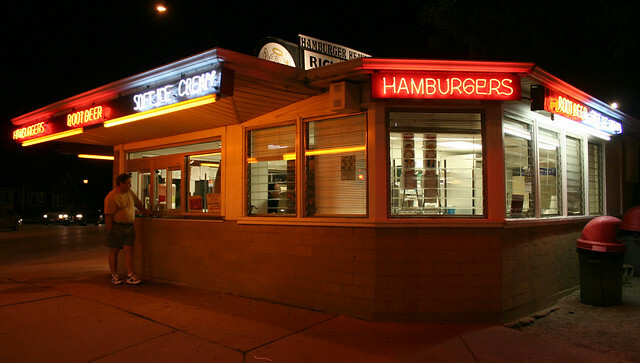 Bill’s Drive In – 120 Asbury, Evanston. Opened circa 1960. The glazed block, flat roof, wall of windows, and sanitary-yellow color are classic Mid-Century roadside. A second style of hot dog & hamburger stand is much more chaotic than the examples above. These are the places where less is truly a bore, so pour on the more! Signs, more signs, lights and still more signs festoon these colorful if incoherent little buildings. 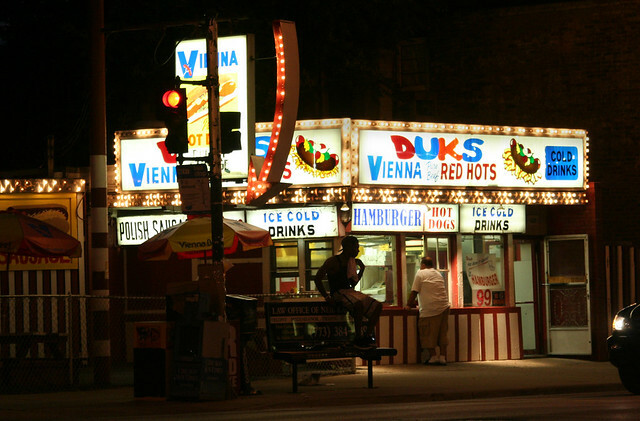 Duks Vienna Red Hots, 636 N. Ashland. Originally a wide-spread Chicago chain called Donald Duks until the Walt Disney corporation sued them, this location opened in 1958. Shelly’s Freeze – 5119 N. Lincoln Avenue. Located at the south end of Lincoln Avenue’s Motel Row, this was originally a Tastee-Freez franchise, open by 1974 at the latest. 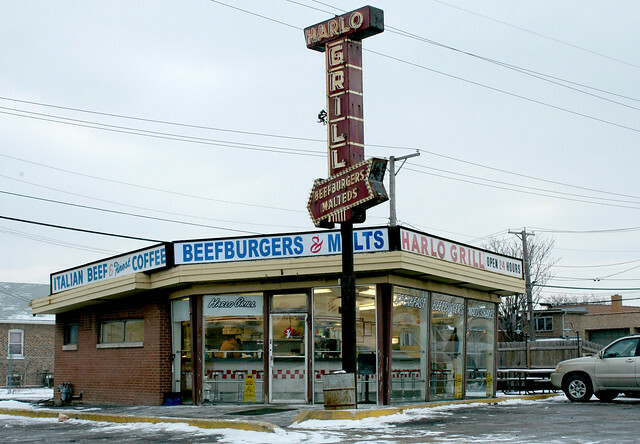 Harlo Grill – 2400 W. North Avenue, Melrose Park – a glass walled serving area with a terrific old neon sign out front. Open by 1957, this is a 24 hour diner with a full menu. 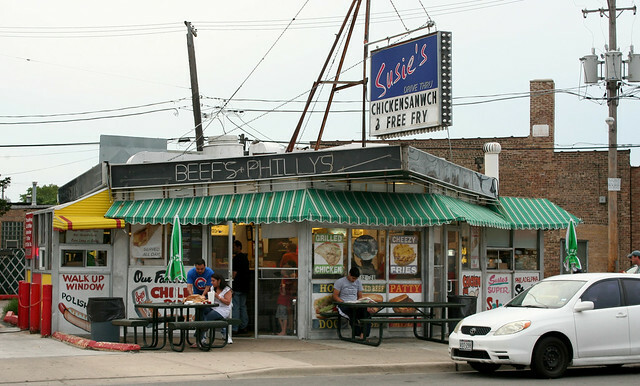 Susie’s Drive Thru, 4126 W. Montrose – a 24-hour greasy spoon. Originally a Tast-e Hast-e location, it became Susie’s in 1974. 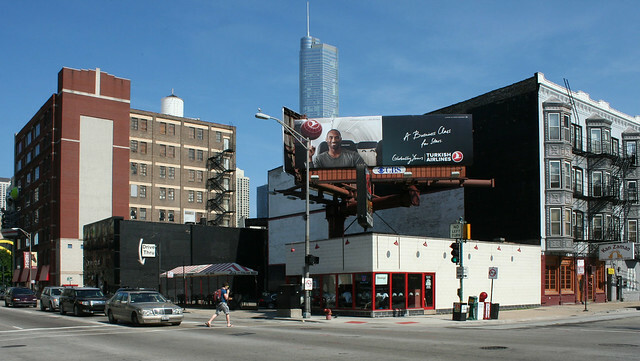 Murph’s Place – 3930 W Montrose Avenue. Closed in 2012. Hamburger Heaven – 281 N. York Street, Elmhurst – opened in 1948, this stand is known for its ice cream and its Richardson Root Beer – and perhaps for that fabulous sign on the roof. Official site is here. Then there are the really stylized places – the ones where, through nostalgia or lucky preservation, the vintage roadside look is in full effect. 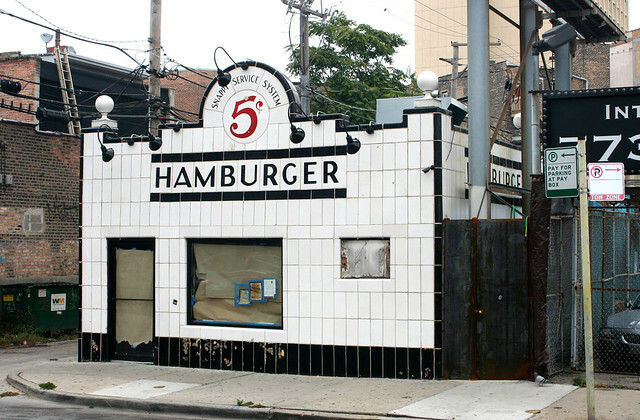 Superdawg – 6363 N. Milwaukee at Devon Avenue, opened in 1948. 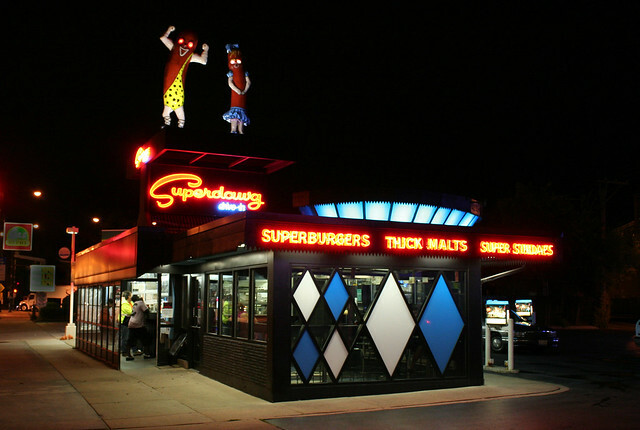 Superdawg is arguably the region’s most famous hot dog stand due to its flamboyant color scheme, 1950s geometry, liberal use of neon, and of course the terrifying anthropoidal hot dog cave man on the roof. 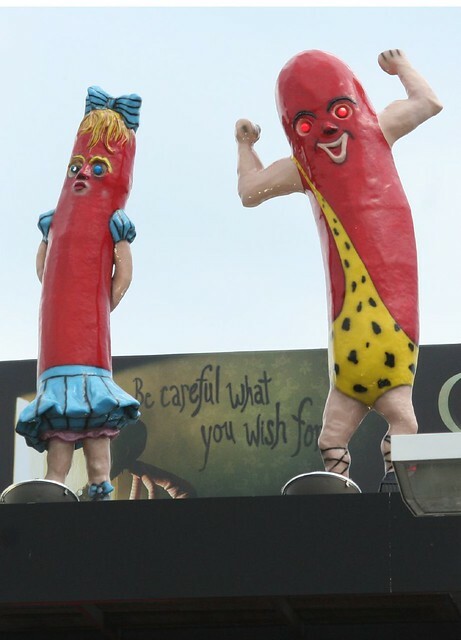 True fact: both him and his demure hot dog ladyfriend have TWO FACES, one on each side. They’re not just humanoid foodstuffs; they’re Janus-faced monstrosities watching your every move. The original building and its expansion were designed by co-owner Maurie Berman. The current look of the restaurant dates from a 1999 renovation and restoration, but largely retains the look of the place from the 1950s. Likewise, carhops still bring your order out to your car while you wait – though you can also go inside and order at the counter. 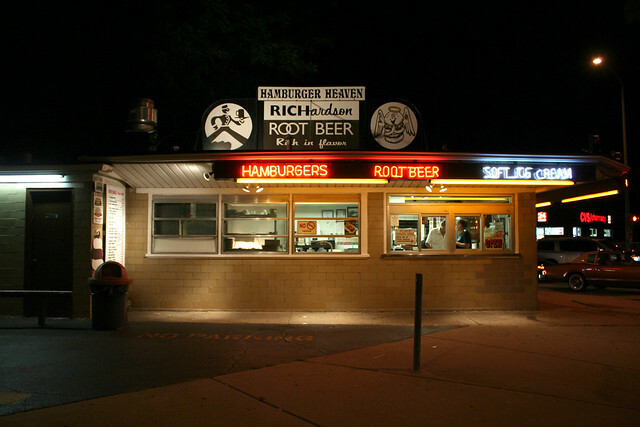 Official Superdawg site, with an outstanding history of the restaurant. Our last two stops are part of a tradition more common to Milwaukee than Chicago: the frozen desert stand. In Milwaukee, several such stands still survive, selling frozen custard in the summer months. They’re considerably rarer in Chicagoland. They’re characterized by a single-slope shallow-pitched roof that rises dramatically over the front serving area, which is walled in glass, and an overall small footprint. Carvel Ice Cream, 7301 N Milwaukee, Niles – opened by 1957, the original franchise lasted into the 1970s. By 1986 it was a Hayes Family Ice Cream Bar, and a year later it was a Dairy Bar. 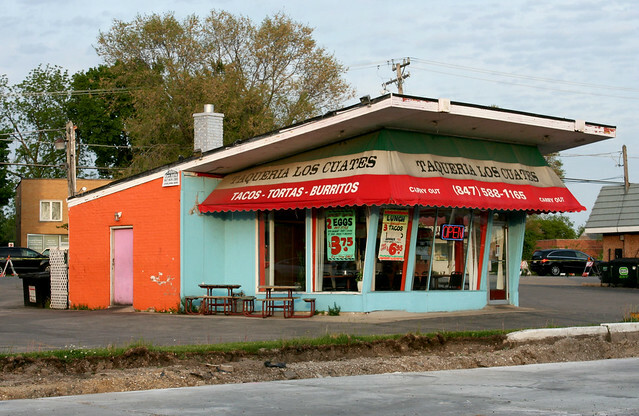 Most recently Taqueria Los Cuates, a Mexican restaurant which closed in 2013. 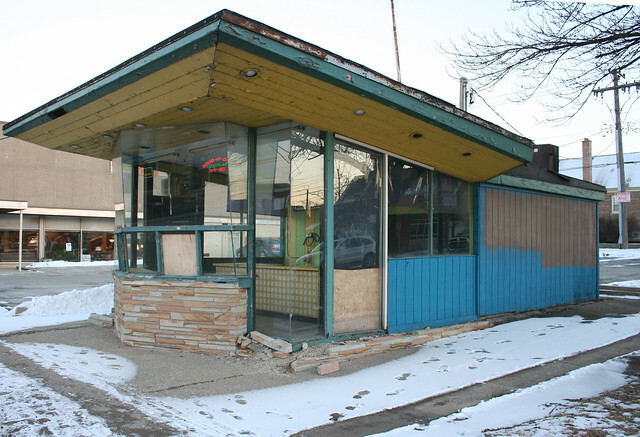 Yellow Submarine, 6825 W. Archer Avenue – now closed. No info on its previous incarnations; the building’s style clearly dates it to the 1950s or early 1960s. This entry was posted in Mid-Century Retail and Storefronts, Roadside architecture, Vernacular architecture. Bookmark the permalink. ← Down by the Riverside! I love the Chicago hot dog and tamale so much that anytime I visit, as I did last month, a trip to a great hot dog stand is a must. 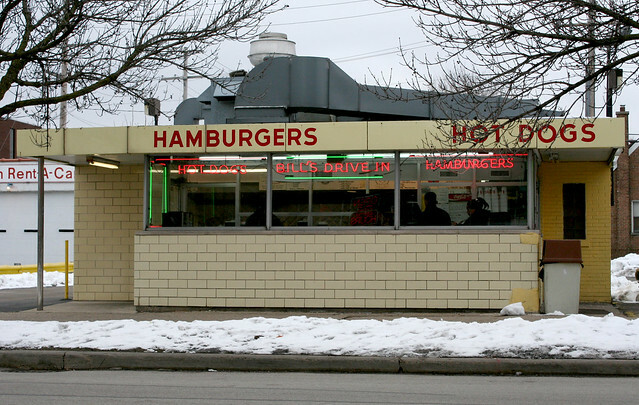 As a north side girl there was Big Herm’s on Dempster in Skokie, Paul’s Umbrella on Touhy and California, Bill’s which you mentioned, Ruby’s and Red Hot Ranch on Devon and of course Superdawg where you could get the best tamales root beer. Now I have a jones for a Chicago hot dog! 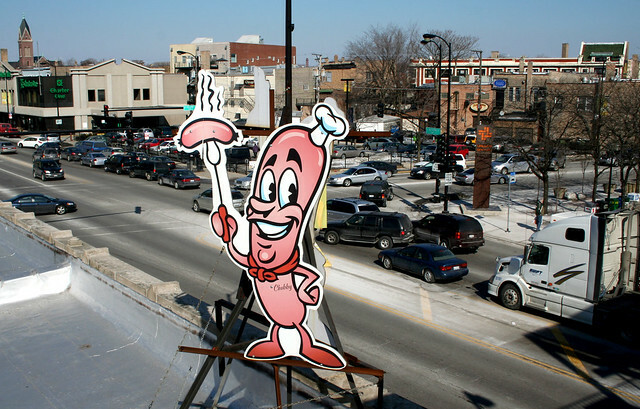 It’s too bad the original hot dog emporium is gone, Fluky’s was first on Roosevelt Rd on the West Side and later on the Western Ave south of Pratt in W Rogers Park.RIP, I can still the taste the hot dog shaped gum they gave away. Hi we have been a DePaul staple in Lincoln park and south loop have been on travel channel written up by Rachel Ray and not even a mention. And what about Parsi’s on Higgins???? Finally closed but we were fans for over 50+ yrs. Even though we lived in CA every time we visited my parents in Park Ridge we made sure to go to Parsi’s. I heard he retired to FL.! OH forgot to mention that when I was a kid in Roger’s Park the first place I fell in love with Chicago hot dogs was…..Paul’s Umbrella! I think they used to close in the winter when he would go to FL!